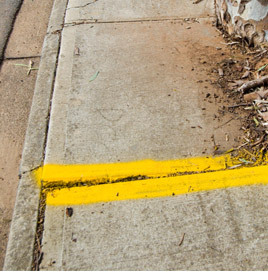 If you suffered serious injury on a sidewalk, curb or street, it may be because of the negligence of a property owner. Did the owner ignore a known safety hazard? Have other people been injured? The law firm of Bracamontes & Vlasak, P.C., can pursue legal action if you were injured because of an unsafe sidewalk, curb or roadway. We handle premises liability litigation in San Francisco and the Bay Area and throughout Northern California. Contact us for prompt investigation of your case. Sidewalks are open to the public and anyone who uses a walkway has an expectation under the law that it conforms to local building codes and is maintained in safe condition. In reality, many sidewalks are in dangerous condition — cracks or potholes, raised or uneven concrete, slippery with debris or water. Property owners have a duty to inspect, maintain and repair unsafe conditions in a timely manner, or to rope off the area or otherwise warn people. We hold private entities and municipalities accountable for serious or permanent injuries from sidewalk accidents. The San Francisco attorneys of BV Law invite you to schedule a free initial consultation about your injuries from unsafe sidewalks and roadways. Email us or call 415.835.6777 to discuss your possible claims.